In a rather amazing development the flat earth theory is making a comeback. Many who take the Bible literally support it and because you find what you are looking for they also claim real science is on their side. I had my first real encounter with flat earth supporters yesterday on a rebel Mormon site and thought that some of my comments are worth recording. Below is mostly my side of the dialog. Reading this will give the reader a general idea of what to expect when encountering such an unusual belief in this day and age. The dialog got so intense and lengthy that the moderator pulled the plug on the conversation. I entered the conversation when the Flat Earthers were telling us that the earth is flat because the Bible mentions the “face of the earth” and says the stars do not move. JJ: “Face of the earth” is symbolic just like the “four corners” which is still used by even some scientists today. The stars are not fixed as their movement has been measured. Using convoluted logic one can explain anything, even something crazy like the internet really does not exist. JJ: Still waiting for a couple scriptures – or how about even one at a time? I’ve listen to about 40 minutes so far of the Bible video you gave us and the guy has given about 5 minutes of information. Hope he can get around to saying something good as I hate to waste time. I’ve already watched flat earth videos which are not convincing. Just give us a couple scriptures proving a flat earth. So, do you think we are being lied to that there is a space station full of astronauts that can actually see the earth is round with a day and night side as they circle around it? (Apparently the Flat Earthers do). JJ: This is what the guy in Flat Earthers video thinks the earth and firmament plus the four corners looks like. JJ: Here is an actual picture of the earth from the moon. In response to the accusation that NASA has a conspiracy to hide the flat earth I said, We’ve had private companies fly up to the space station. And Russia, China, Japan and the EU have lots of space pictures and probes. Next they say that the pictures of the earth from space here false because they show no stars. To this I said, The earth reflects too much light for the cameras to capture the stars. This is why you cannot see stars in the daytime. Now the Hubble telescope captures billions of stars because the cameras are adjusted to capture their light. I wonder where this picture of a round Saturn being circled by round moons fits into the flat earth idea. Next the Flat Earthers claimed that all the NASA pictures are fake. I said, You’re just being silly here. Faking millions of original pictures and fooling thousands of NASA employees and private contractors would be impossible. If it is all fake then why do not other nations in space question NASA??? The Saturn pictures taken by Cassini are a joint effort between NASA and the European Space Agency. I guess the whole world is in on the conspiracy for some really crazy purpose that accomplishes nothing. It is no secret that NASA uses some composite pictures for the sake of clarity. Everyone knows that who pays attention and NASA usually tells us what it is doing. They also give us illustrations when needed. That doesn’t mean the earth is flat. And where are those scriptures we asked for? (The Flat Earth people believe the earth sets upon pillars. as symbolically portrayed in the Bible. To this I said:) I’m familiar with your version of all you say and it has nothing to do with a flat earth. Tell us where the pillars are so we can take a look and take pictures. Still waiting for your scriptural proof. He finally posted dozens of scriptures, but with no explanation of why they prove a flat earth. To this I said, I don’t want some shot gun blast of scriptures that prove nothing about a flat earth. Pick one at a time and we’ll discuss it. When you make your pick give us your reasoning as to why it is supposed to say the earth is flat. 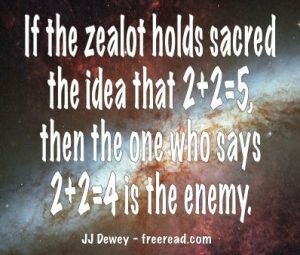 If the scripture is true then it is true as a unit or grouped in with others. Just throwing dozens of scriptures at me that prove nothing of a flat earth, except in your mind and is completely meaningless. The only way to do it is use one (or maybe two if linked) and examine them for what they say. If you can’t do that then you have no argument. No one has time to counter pages and pages of scriptures. I do not want to write you a book. So how does that prove the earth is flat? 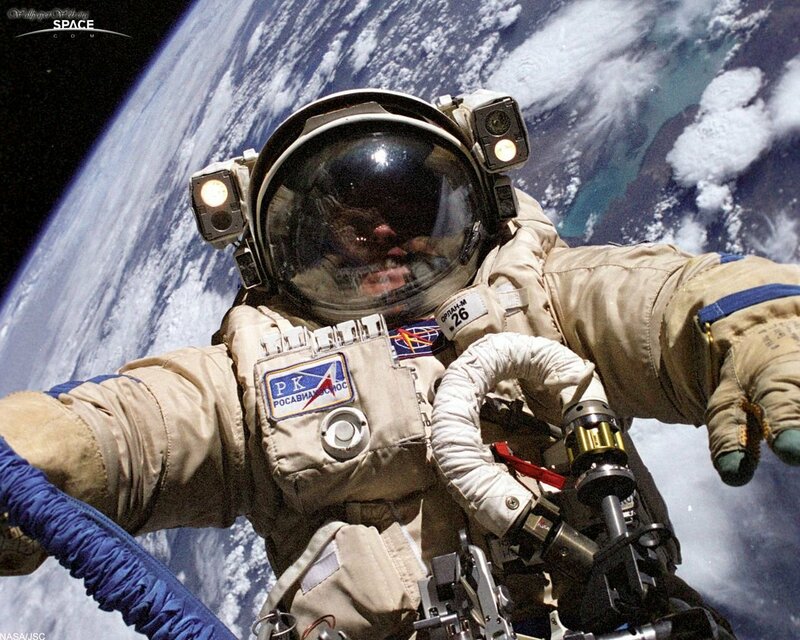 JJ: Here is a picture of a Russian in space. Are they part of the conspiracy? Notice the round earth in the background. Russia and China who aren’t that friendly, want to help us fool the world? That us just silly. Every time you say something that is not logical you blame it on a one world conspiracy. If that is your single reply to everything reasoning does not count for much. Imagine Jesus saying to the religious leaders that they were wrong because they were controlled by a conspiracy. Instead he reasoned with them, often point by point. He who is right will be he who makes sense. If you are right then there are thousands of people in on the conspiracy and all of them are keeping quiet. In real life if three or more people are in on a secret it is not a secret for long. Keeping thousands quiet would be impossible. When the Chinese go to the Moon will you say that is fake also? How about when private enterprise goes to Mars? Thousands would have to know. There would be no way to hide such a vast conspiracy from those actually working on the programs and doing the math. Photoshopping is one thing but the creation of thousands of beautiful and original images is another and would be impossible feat for a bunch of deceivers. Here is just one galaxy never imagined until a photo was taken. To the accusation that all of NASA’s videos and pictures are made in a studio I said, You have no proof that billions are going to a movie studio or that all the Hubble images are imaginary creations and you can show me no collection anywhere with even 1% of creations like the Hubble generated. With thousands of employees that would have to know the truth you would think that one would come forward and expose them. Common sense is pretty strong proof. You need to show us some evidence that the earth rests upon literal physical pillars. If they physically exists then we should be able to see them from space. Mr Smith may be a pillar of society, but he is not a pillar in the house building sense. Elon Musk of Tesla sent a rocket to the International space station. Is private enterprise part of the conspiracy? I’ll bet that if China or even a private company goes to the moon and finds an old lunar module and takes pictures of earth that match Apollo the Flat Earthers would still not believe. And why do skeptics think this? From this they assume the Bible teaches the earth is a flat piece of ground with four sharp corners at each end. The first point to make is that this phrase is still in use today by people who know the earth is round. It is used as a figure of speech and not intended to state the earth has four actual corners. On top of this the word “corners” is a mistranslation from the Hebrew KANAPH. This is more accurately translated as “extremity, farthest reaches or border.” In this context the prophet was merely saying that Judah will be gathered from the farthest places they have been scattered from all directions. Nothing about the shape of the earth is indicated here. 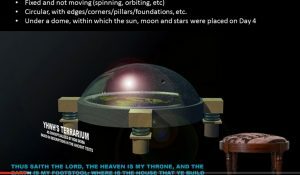 Flat Earthers say the Bible teaches the earth is covered by a great solid dome which it calls the firmament and the stars are tiny lights in it. Many ancient peoples thought the earth was flat and was encircled by a dome. Some ancient books that didn’t make it into the Bible indicate the writers had some odd beliefs like these but the Bible itself does not. 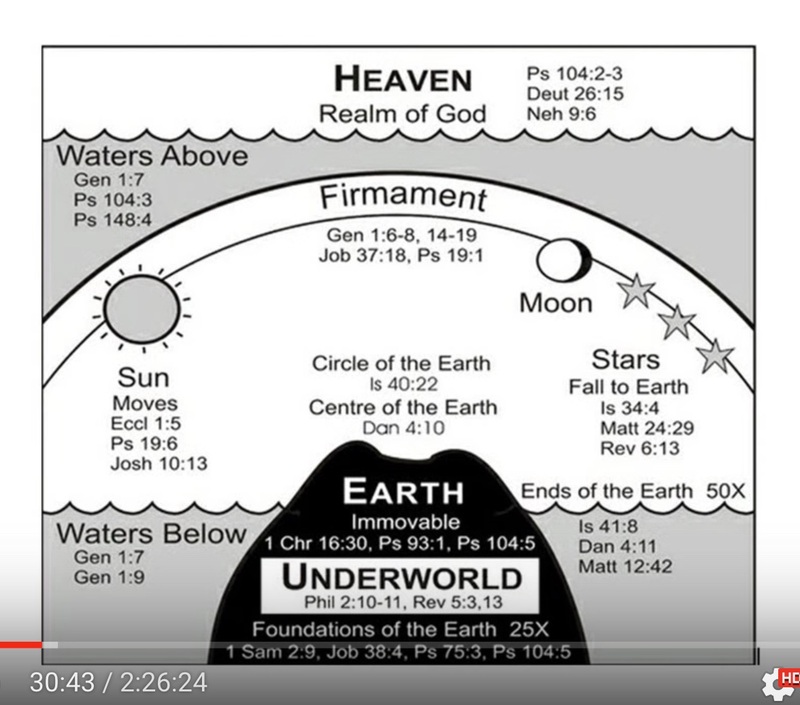 Obviously the firmament mentioned in the Bible was not a solid dome. We are told that God created the birds that “fly above the earth in the open firmament of heaven.” (Gen 1:20) Obviously the birds do not fly in a solid dome, but the atmosphere which is part of the firmament. “He drew a circular horizon on the face of the waters, at the boundary of light and darkness.” Job 26:10 New king James. Sounds to me like the ancient prophets saw the circular form of the earth on the horizon of the waters and were commenting on it. Flat Earthers note that the Bible says God created the Moon as a “lesser light.” They say that God didn’t seem to know that the moon doesn’t have a light of its own but reflects it from the sun. This is a weak argument. Even today most people talk about the light of the moon, but that doesn’t mean they are saying it creates its own light. The Flat Earther emphasized the idea of taking the Bible literally. To this I said, The context usually reveals whether something is literal or not. Words are not literally a strong wind. Sky there comes from the Hebrew SHACHAQ which literally means “a cloud of dust.” and is usually translated as “cloud.” The King James translates it as “sky” here because this seemed to make more sense than clouds. Molten comes from YATSAQ which means to “pour, or “flow.” This can indicate something cast and hardened , or something flowing. The Looking Glass comes from RĔ’IY which means “mirror or looking glass. “Hast thou with him beat through the powerful storm clouds with the strength of a hard mirror? Well, we know that neither the clouds or the sky are solid for birds, airplanes and rockets fly through both of them. The verse seems to be emphasizing God’s power to control the weather, part the storm clouds, or the skies. There is no mention of some hard dome at the top of the sky or above the clouds. Wilt thou establish with him foundations for the ancient heavens? They are strong as molten mirror. Genesis1:6 And God said, Let there be a firmament in the midst of the waters, and let it divide the waters from the waters. Genesis1:7 And God made the firmament, and divided the waters which were under the firmament from the waters which were above the firmament: and it was so. Genesis1:8 And God called the firmament Heaven. And the evening and the morning were the second day. Since reality disagrees with your interpretation of this scripture it has to mean that you wrongly interpret it. We have sent spacecraft billions of miles into space and not found any huge layer of water out there, nor have we spotted anything with our telescopes and instruments which are fully capable of detecting water in space. So…, what does this scripture mean? 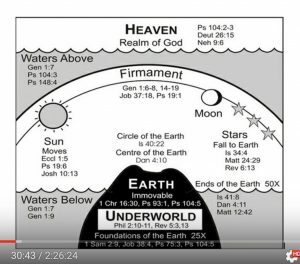 What are the waters above the firmament? First we are clearly told that “God called the firmament Heaven.” and that birds fly in this firmament. (Gen 1:20). And where are there waters in or above the firmament? It is called rain. Rain comes from the clouds which are waters in and above the firmament we live in and waters below the firmament are the oceans, lakes and rivers. Space itself is often referred to as water – the “waters of space” is a common term, if one wants to pursue another explanation. The ancients though did not understand what the vacuum of space was. I do not see any evidence from your Enoch passage that sheds any light. He says the earth has foundations and a cornerstone but every creation has this, even your physical body. Not all foundations of form are exactly like the foundation of a house. In any attempt at interpretation you need to eliminate the obvious. For instance, one could interpret that there was grass growing in the light before the sun was created on the fourth day and we know that there can be no physical grass growing without the sun. I think all of us have seen NASA satellites circling the earth a number of times. It is silly to knee jerk reject what you see with your own eyes. I’ve also seen a number of planets through telescopes. The Flat Earther claimed that the evenness of the light around the moon followed by great contrast proved the flat earth theory. To this I said, The abrupt change on the moon from light to darkness occurs because the moon has no atmosphere. The same thing happens on the planet Mercury and all the asteroids with no atmosphere. The idea is presented that temperatures are cooler in moonlight because the moon does not reflect the light of the sun, but creates its own cold light. For some reason this is supposed to prove the earth is flat. Even if this were true (which it is not) it would not prove the earth is flat. If the moon were a generator of light, like the sun, then it would be lighted through all of its surface. The fact that only half of it is lighted and we see the phases of the moon proves that it reflects light and does not generate its own. The sun which does generate its own light has no phases and is lighted throughout all its surface. This would be the case with the moon if it generated its own light. That said, infrared “laser” thermometers do register a colder temperature in moonlight than in the shade. The moon being a reflector of sunlight reflects light with negligible infrared. On top of this objects exposed to the night sky will radiate their heat into it. Objects exposed to less of the sky (such as under a tree) can “see” less of the sky and will radiate less heat to the sky. Similarly shaded locations are often warmer the same way the earth is warmer with a night cloud cover. These anomalies in temperature certainly do not prove either a flat earth or that the moon generates her own light (A key component of the Flat Earth Theory). If our moon generated its own light then all the other planets and their moons would also and we can observe through telescopes that they reflect the light of the sun, which light directly diminishes according to the distance from the sun. It may be mentioned 300 times isn the entire Bible but we are talking about Job 37:18 and the word “foundation” is not in the original Hebrew and modern scholars recognize this and give a better rendition. No one said there was not a word for foundation – it is just not in this verse from Job and was a mistake of the old translator to put it in there. Then you make the outrageous statement that I am calling God a liar because the word foundation was not in the Hebrew of Job 37:18. Strange accusation indeed. Yeah, and such water is called rain. Happens today. If we take this literally then the place where God sits would be a height in which the average person would appear to be the size of a grasshopper. That would be around 1000 feet, definitely less than the height a typical airliner flies. Therefore we should easily be able to discover this place where God is walking, but alas we have not. Why? Because it is speaking symbolically just as it does about the four corners of the earth. But if you take the four corners or pillars literally also then please show me where they are. Flat Earther, “And the earth was without form, and void; and darkness was upon the face of the deep. And the Spirit of God moved upon the face of the waters. The actual creation of the heavens and the earth are described in verse one. That which follows is a mere reorganization. The words “without form” are translated from the Hebrew TOHUW which literally means “to lie waste” or implies a “desolation”, or “destruction”. This sheds an entirely different light on the subject and as evidence that there was a time lapse between verses one and two we read that: “He (God) created it (the earth) NOT in VAIN (“Vain” comes from the same Hebrew word TOHUW) but formed it to be inhabited.” Isaiah 45:18. Since the earth was not created in a state of TOHUW or destruction, but was formed to receive inhabitants then the period of destruction described in verse two had to take place after a significant time lapse. There is only one other place in the Bible where these two words are used together. It is used describing the destruction of Babylon, but mistranslated: “The smoke thereof shall go up for ever: from generation to generation it shall lie waste; non shall pass through it for ever and ever, but the cormorant and the bittern shall possess it; and the owl also and the raven shall dwell in it; and shall stretch out upon it the line of confusion (TOHUW, desolation) and the stones of emptiness” (BOHUW, a wasteland). Isaiah 34:10-11. In this state the earth had the deep and the waters which were of course part of God’s creation. No mystery there. MOS 1:27 And it came to pass, as the voice was still speaking, Moses cast his eyes and beheld the earth, yea, even all of it; and there was not a particle of it which he did not behold, discerning it by the spirit of God. MOS 1:28 And he beheld also the inhabitants thereof, and there was not a soul which he beheld not; and he discerned them by the Spirit of God; and their numbers were great, even numberless as the sand upon the sea shore. MOS 1:29 And he beheld many lands; and each land was called earth, and there were inhabitants on the face thereof. Moses saw every particle of the earth and all its inhabitants at one time as well as many other earths like this one. Thus Jesus seeing the kingdoms of the world at one glance was not that big of a deal. The other scriptures you relate do not support a flat earth so there is not much more for me to refute. That was the essence of my part of the conversation. Hope it is helpful or at least entertaining. Mate- you are a total spaz ! Anyone with half a brain could pick out the crap in that total load of rubbish you just spilled out.I say to anyone – do the research and do not listen to idiots. If anyone wants to have a two sided talk about what science is and not all these lies – this chap is a gov agent just spreading crap to divide people. The truth is much bigger than the flat earth theory.